Visitors to the park find a curving walkway, a community garden abloom with 15 flowering beds, transplanted apple trees with seating at their base, wrought iron fences and a handsome, six-foot gate. More information, including plot availability, is located on the Recreation and Parks Department Urban Agriculture website. 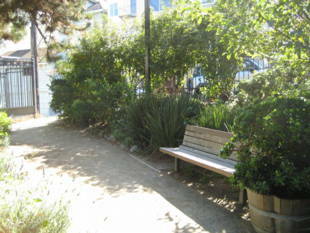 Page/Laguna Mini-Park is owned by the San Francisco Recreation and Park Department. #6-Parnassus or #71-Haight/Noriega bus to Page and Octavia stop; walk west 3/4 of a block towards Laguna. Park will be on left. 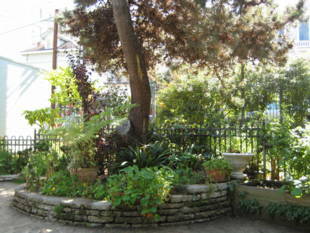 This small park, nestled between two Victorians, is easy to miss riding by on MUNI. Originally, it was the site of a roomy Victorian apartment house built in 1910. After it fell into decline, the house was condemned and purchased by the city in 1969. The city demolished the building and made plans to convert the land into a mini-park, part of a development trend in the 1970s when small, neglected neighborhood parks were being built with federal funding. The Page-Laguna Neighborhood Association petitioned the city for a park and worked its way through the accompanying bureaucratic maze. In 1972, the park was completed. It featured a picnic area, climbing platform surrounded by a sandbox, and three stationary mustang horses. The neighborhood was a particularly vital place in those years. Among its creative residents were Stuart Brand, founder of 'The Whole Earth Catalog;' poets Philip Whalen, Diane di Prima and Jane Hirshfield; cookbook writer Deborah Madison ('Greens Cookbook'); counterculture revolutionary Paul Krasner; actor Peter Coyote, and director Rob Epstein (1985 Academy Award-winner, 'The Times of Harvey Milk'). Despite its illustrious neighbors, the park deteriorated. The dope smoking and acid trips of the '70s were replaced by crack dealing and prostitution in the late '80s. Overwhelmed by the problems, the neighborhood association disbanded and the community gave up. Enter the state-funded Neighborhood in Transition Multicultural Partnership (NIT-AMP). 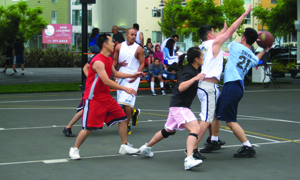 In 1980, Hayes Valley was identified as one of the transitional neighborhoods to receive funding and support. 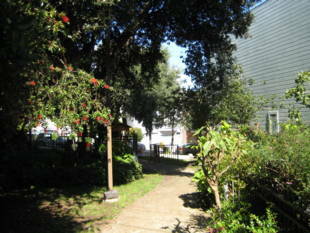 It revitalized residents who, in 1994, formed the Hayes Valley Neighborhood Parks Group, organized their community, and reclaimed their park. The San Francisco League of Urban Gardeners (SLUG) played a major role, providing a $5,000 startup donation, professional consultation, and an intern to mount a series of community workshops. Working with grassroots determination reinforced by SLUG, the Hayes Valley Neighborhood Parks Group was able to negotiate the twisted paths of the Open Space Citizens Advisory Committee, the Mayor's Office of Community Development (MOCD) and the Recreation and Park Department. The project was put on track in the fall of 1997 and celebrated its opening day in April, 1999.